Song Zihui is an artist. 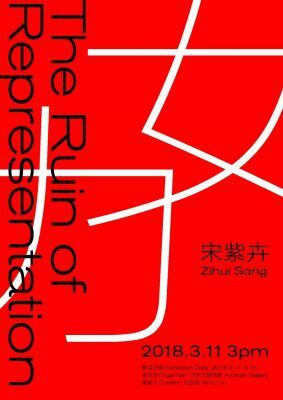 Arcadia Gallery is honored to announce young artist Zihui Song's solo exhibition Women's Power | The Ruin of Representation. Song's art practice is focusing on exploring women's bewilderment and challenges in the context of Chinese patriarchal society. The artist extracts and magnifies the phenomenon of female alienation in contemporary culture and reconstructs it in her work. By using symbolic signs, Song's art reflects and criticizes the issues of the objectification and dismemberment of women in mass media. In addition, her work opens a debate on internalized misogyny under Chinese patriarchal society. In this exhibition, we will present a series of artist's work comprising photography, video, performance, and installation. Multi-channel video installation What We Talk AboutWhen We Talk About Abortion? is a fiction short film about a post-abortion support group that includes five women talking about their experiences. In this work, the artist introduces five stereotypical female characters by using dramatic scenes and performance. With her smooth narrative structure, Songsubtly inserts the social issues into the characters' discussion. Through the depiction of women with different social backgrounds and their express logic, the artist addresses how patriarchal mentality in culture consciously and unconsciously influences women, who submit to and follow patriarchal social standards blindly. The artist's three new pieces in this show are focusing on female's internal conflicts to discuss the moralization of the woman under patriarchal culture. In her work Women's Power, Untitled Body and We Can DoIt！？, the artist is utilizing the prevalent phenomenon of "beating the mistresses" over recent years for her projects'background, revealing a perverse internalized misogyny under the power of mass media. Women's Power is appropriating videos of wives beating mistresses that husbands cheated on and TV dramas on social media, with the bizarre editing effects and her use of reflection, the artist enforces the viewers to become the subject and object of gaze at the same time, thus, the viewer is standing inside the work. Untitled Body has erased the subjects' identities as women and turned them into the subjects to the dismemberment of the body, it magnifies"the victim's" emotional and physical pain at the same time. In her installation work, We Can Do It！？, the artist re-appropriates J. Howard Miller'sAmerican wartime propaganda poster, this poster was originally used for Westinghouse Electric as an inspirational image to boost female worker morale.Song localizes the subject matter of the poster and deviates it from its following representation of feminism promotion and women's empowerment. In her work, Song indicates women's violence against each other and she also emphasizes the displacement of the image and its meaning during culture development. Additionally, the artist expresses her concern about the development of feminism in China under media spectacle.